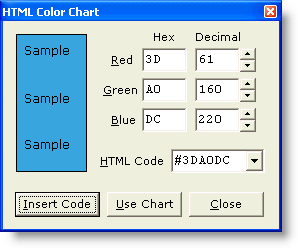 The HTML Color Chart command presents a pop-up dialog that allows color values to be viewed and adjusted by varying the Red, Green and Blue components. RGB values are shown in both hexadecimal and decimal format.. The current color is displayed in a rectangle at the left, along with sample text in black and white to show the contrast that would result for those color combinations. The value required to display the current color is shown in the box labeled HTML Code. The drop-down list holds a history list of recently used color codes. You can type an HTML color value directly into the HTML Code combobox, if you wish. The Use Chart button can be used to summon the standard Windows color dialog so that a selection can be made from a color palette. The Insert Code button is used to insert the HTML Code into the current text file. If the HTML Color Chart is left on-screen when Boxer is closed, it will be automatically reopened if the edit session is later restored.